Ishrat Jahan, who is one of the petitioners of instant triple talaq had claimed that two of her children have gone missing. She has submitted her complaint copy at Golabari police station claiming that her seven and thirteen-year old children have been kidnapped. 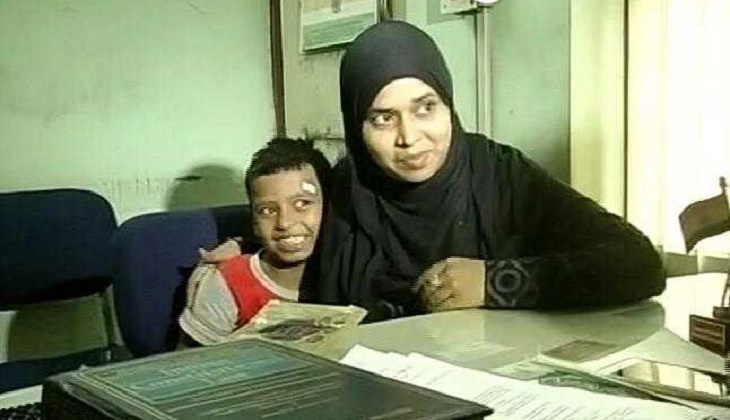 Ishrat Jahan today went to the Golabari police station, Howrah, West Bengal and filed an official complaint against her in-laws for allegedly kidnapping her children. Ishrat Jahan is one of the petitioners who raised her voice against Triple Talaq. After the verdict of Supreme Court on triple talaq, she has claimed that she is being harassed by her in-laws. Initially, when she filed the complaint, the police immediately stepped-in and begin the probe. The Supreme Court on Tuesday gave historic judgment on the basis of majority, speaking out of Triple Talaq in the Indian Muslim community, Triple Talaq was termed as ‘unconstitutional’ and ‘arbitrary’ and said that it was not the ‘part of Islam’. However, in the minority judgment given by two judges, that the ‘Talaq-e-Biddat’ is the issue of the personal law of the Muslim community and it does not violate Article 25 (religious freedom) of the Constitution. In addition to the ruling Bharatiya Janata Party (BJP), all the parties including Prime Minister, Congress, and women organizations appreciated Supreme Court verdict. Welcoming the decision of the Supreme Court, the All India Muslim Personal Law Board (AIMPLB) said that this decision protects the Muslim Personal Law. At the same time, political parties have given this decision the right to equate Muslim women with gender equality and gender justice. The Chief Judge, comprising Justice JS Khehar and S. Abdul Nazir of the five judges bench, while announcing the minority verdict, banned Triple Talaq simultaneously for six months and said that meanwhile, the government should consider making a law on this issue. He also appealed to various political parties to forget their differences and make laws related to it. The other three judges in the Constitution bench, however, expressed their disagreement with the decision of Justice Khehar and Justice Nazir. The Supreme Court has pronounced this verdict on the petition filed by Shayara Bano, Muslim organizations and four other women. He said, “Therefore, such divorce should be considered to be violative of the basic rights provided by Article 14 of the Constitution.” In addition, the three judges said that the 1937 Sharia Act was also abolished. Justice Joseph said that it is very difficult for the Chief Justice to agree on the argument that three divorces should be considered an integral part of the religion and this is part of their personal law. He said that only because some custom has been going on for hundreds of years and that the tradition in that religion has been clearly stated as inappropriate, that tradition can not be considered statutory. Even in the minority judgment, it was also said that a large population of Muslim women are in favor of Triple Talaq, declaring it lawfully unacceptable. In the minority verdict, the Supreme Court said that religion is a subject of faith, not logic, and no court has a place to accept the principle of equality against traditional customs. In his judgment given by three votes in favor of two, he said that three divorces do not receive constitutional protection because it is “arbitrary and crazy”, and this causes the possibility of reconciliation between husband and wife. Giving examples of the amendments made in the Muslim Personal Law throughout the world, Justice Khehar instructed the central government to form proper laws on Talaq-e-Biddat. Justice Khair ordered the Muslim men not to divorce their wife on the basis of Triple Talaq for six months.